"The kids can help fill the nests." Line a cookie sheet with foil and grease with spray-on cooking oil. Pour noodles into a large bowl. Melt the butter and marshmallows over medium heat, stirring until smooth. Pour marshmallow mixture over noodles, stirring until well coated. Rub some butter on hands and form noodle mixture into six round balls. Place balls on prepared cookie sheet. With the back of a teaspoon, press the center of each ball to make a hollow indentation. A very festive and sweet edible decoration! Great fun to make with my children and they taste good too. 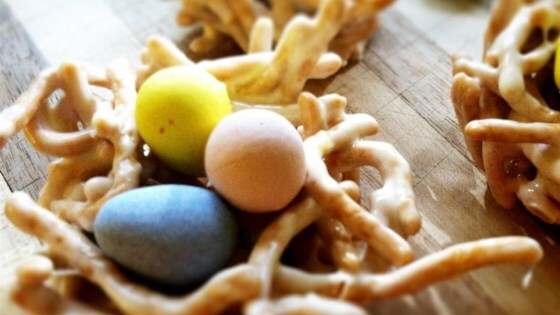 Reeses Peanut Butter Eggs are the perfect size and come in great pastel colors for the eggs. This was the basic recipe I was looking for- thanks!